Sea of Cortez Sailing - Cruise Mexico's Most Famous Anchorages! Sailing the Sea of Cortez – Cruise Mexico’s Most Famous Anchorages! Between 2010 and 2013 we sailed our 2008 Hunter 44DS sailboat along Mexico’s entire Pacific coast, from Ensenada in the north and Mexico’s border with Guatemala in the south. In the spring of 2011 and the fall of 2012 we sailed up and down the Sea of Cortez, mostly along the east coast of Baja California, and we visited almost all the anchorages between San Carlos and La Paz. 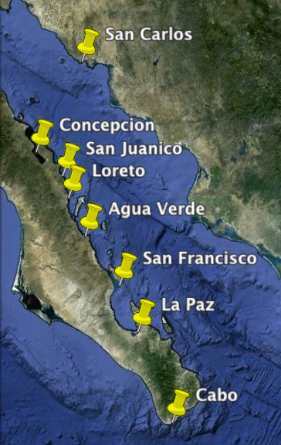 If you are not familiar with the location of these popular anchorages in the Sea of Cortez, check out Maps of Mexico’s Anchorages for more detail. The Sea of Cortez, also known as the Gulf of California, is a stunning, raw land of contrasts. From languid tropical bliss to raging, violent storms, the Sea has shown us her glory and her fury, as she does to every sailor that ventures there. Sea of Cortez Sailing is at its best in October and May. You may want to run your cabin heater in January (and you definitely won’t want to swim). In August you will find yourself baking beyond belief (but the water will be a balmy 90+ degrees F! For a very funny read about this area, check out The Log from the Sea of Cortez by John Steinbeck. There is a middle chapter by a chum of his that is very esoteric and boring. You’ll know it when you get there. The rest is absolutely hilarious.